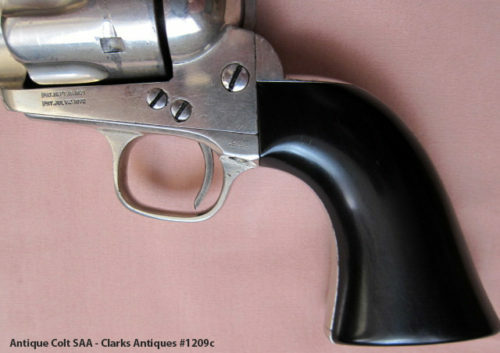 If you are looking for an antique Colt SAA 45 cal. revolver in excellent condition, then look no further. 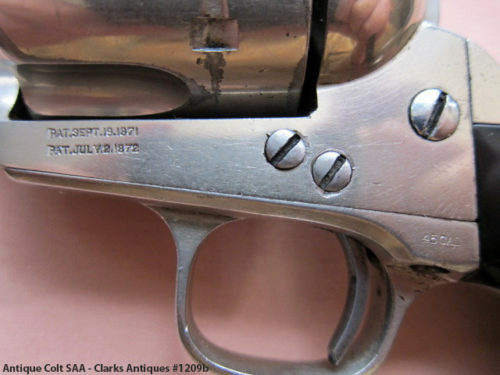 This is the type of Colt Single Action every collector is looking for. This great looking EARLY Colt SAA black powder revolver would enhance any top condition collection. These early Colt revolvers were highly prized in their own time. Thus, these revolvers were often decorated with deluxe finishes and fancy hand grips. Accordingly, this particular Colt was embellished with dealer applied nickel finish and ebony grips. This Colt SAA, serial #22XXX, was shipped to Hodgkins & Haigh, New York, on April 8, 1876. A factory letter is included. The letter list the finish as blue. However, the stocks & barrel length (7 ½”) are not listed. Accordingly, it was common practice for dealers to add special finishes and stocks that will not show up on the factory letter. This Colt SAA is in excellent overall condition showing little use. While it retains approx. 95% of the original muted nickel finish, the revolver shows wear at the edges. In addition, the markings are sharp, all numbers match with strong two-line patent dates. Lastly, the hammer shows traces of case hardening. The grips are beautifully made. Also, the grips fit impeccably and are numbered to the gun. In short, they are in excellent condition. Likewise, the mechanics are good and the bore is very good. Although, the front sight has been re-shaped slightly and the stiff hammer main spring replaced with one of lighter tension. Lastly, the gun has the early “donut head” ejector with all the other parts of the gun looking to be original.